The purpose of this tutorial is to highlight how users can customize their QRadar user interface to improve their Threat Intelligence capabilities. We will look at two simple step-by-step customizations - IP address and port lookups on external Threat Intelligence websites. To complete this tutorial, we require root access to QRadar SSH on port 22. For the purpose of this tutorial, we will use the Bitvise SSH Client to complete the steps. The same set of commands can be performed with other SSH clients such as Putty. Upon completion of this customization, the user should be able to gather more information, such as geographic location, WHOIS data, and communicating files about any displayed IP address on the QRadar user interface with just a right-click. Below are some commonly used and well-known Threat Intelligence sources for IP addresses. In this tutorial, we will add these sources to QRadar. However, the list can be as big as one desires. Below is a screenshot of what we aim to achieve in this tutorial. Each of our Threat Intelligence sources resides at a specific URL. The first step involves finding the specific search URL for each source. This may be achieved by visiting the website and performing a manual search. Ideally, we aim to compute a URL in which the IP address is explicitly mentioned. In the URL https://some_website.com/search/1.2.3.4, we can see that the IP address 1.2.3.4 is being mentioned explicitly. The need for such a URL is because we will replace the IP address with the variable %IP%. This variable is QRadar's notation of the IP address that we right-click. The above URL will now be transformed into https://some_website.com/search/%IP%. Below are the final URLs for each of our example Threat Intelligence sources with the IP notation. In this step, we will edit the ip_context_menu.xml file. We will add the newly gathered Threat Intelligence URLs to the XML file. By default, the ip_context_menu.xml file will already include the X-Force Exchange URL. The process to add new sources is straightforward. We simply need to create a new self-closing <menuEntry/> element for each Threat Intelligence source. Below are the entries for our sources. Once completed, save and close the file. Upon the completion of the above step, launch the QRadar user interface via a web browser. Navigate to the Offenses, Log Activity or Network Activity tab. Right-click on any IP address. For example, any IP address listed under the Source IP or Destination IP columns. Click on your desired source and a new window should pop-up with the content. 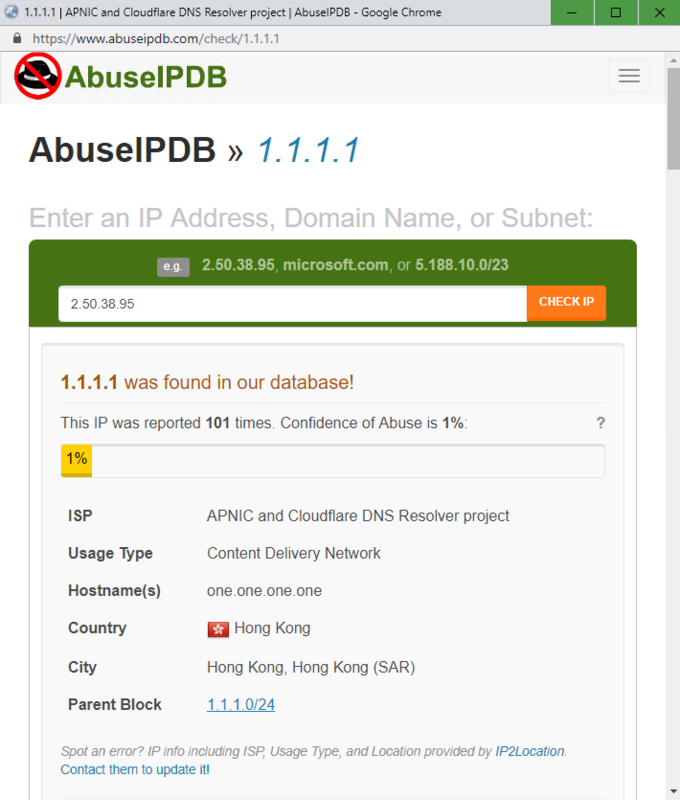 Below is a screenshot of the IP address 1.1.1.1 on AbuseIP DB. Upon completion of this customization, the user should be able to gather more information, such as protocols, services, and known vulnerabilities about any displayed destination port on the QRadar user interface with just a right-click. In this tutorial, we will add the Speed Guide TCP/IP Ports Database, a well-known Threat Intelligence source for port assignments. To use this URL with QRadar, we need to replace the port with the $destinationPort$ variable. This variable is QRadar's notation of the destination port that we right-click. In the next step, we will edit the arielRightClick.properties file. We will add the newly gathered Threat Intelligence URL from the above step to this file. In the above lines of code, it is important to pay attention to the below fields. arielProperty specifies which field would display the option when right-clicked. In our case, we want to enable the Threat Intelligence source as a right-click option on a destination port. text specifies the text which is displayed as an option. url specifies the QRadar-friendly URL that we constructed above. For the changes to take effect, the QRadar web server needs to be restarted. This can be done by clicking on the Restart Web Server button navigable via Admin > Advanced > Restart Web Server. Upon the completion of the above step, launch the QRadar user interface via a web browser. Navigate to the Offenses, Log Activity or Network Activity tab. Right-click on any destination port. For example, any port listed under the Destination Port column. In this tutorial, we went through two step-by-step processes of customizing the QRadar user interface to enhance the analysis process. We added various Threat Intelligence sources for IP addresses and destination ports. As we have seen, the customizations simply involve gathering the right URLs in the QRadar notation and editing certain system files in the correct syntax.